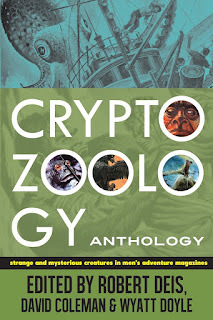 During the late 1970s and early 1980s, I purchased a trio of fascinating books that totally captivated me, reading them from cover to cover and then re-reading them numerous times thereafter. Indeed, even today I still return to them periodically and dip inside their fact-filled pages. 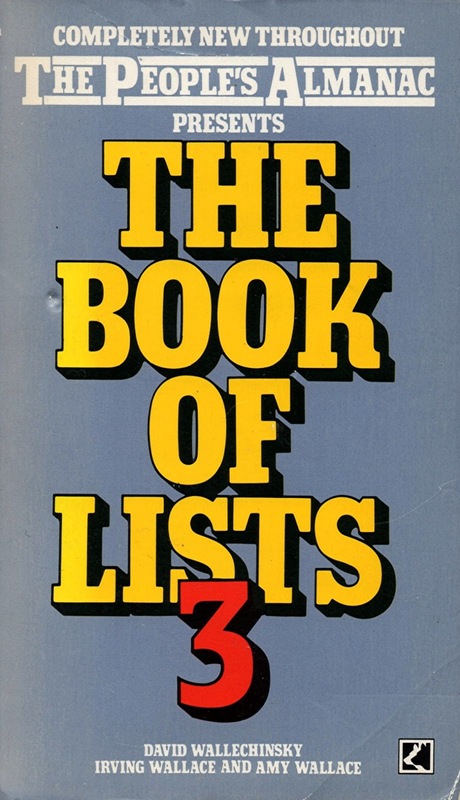 Presented by The People's Almanac, these international bestsellers were: The Book of Lists (1977), The Book of Lists 2 (1980), and The Book of Lists 3 (1983). 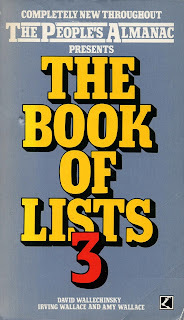 They were written by David Wallechinsky, Irving Wallace, and Amy Wallace, and, as their titles suggest, they were packed throughout with annotated lists on every conceivable subject, and included many specialist ones that were compiled by a lengthy series of credited contributors with extensive knowledge on those particular s objects. 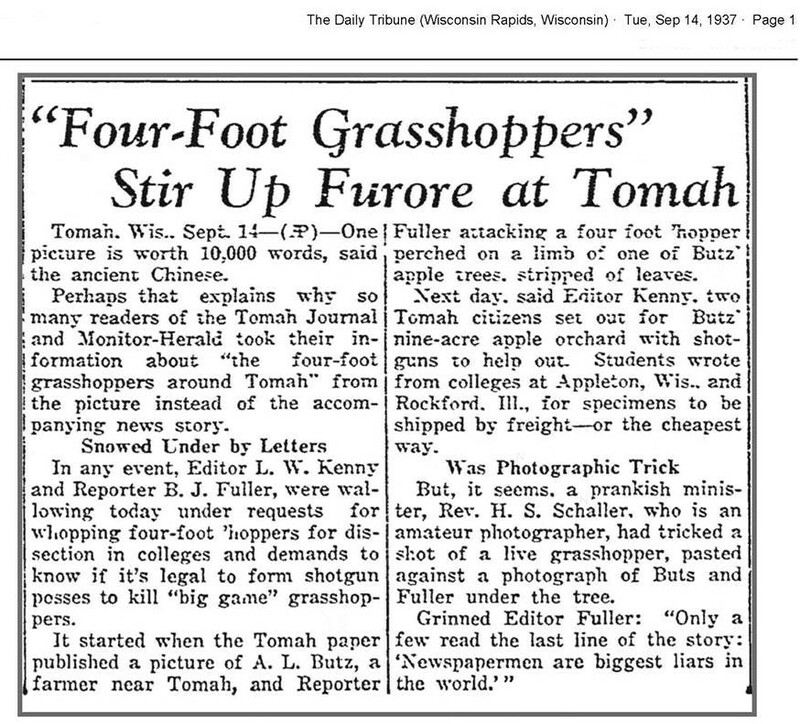 On Sept. 9, 1937, the following headline appeared on the front page of the Tomah (Wis.) Monitor-Herald: "Giant Grasshoppers Invade Butts Orchard East of City." The accompanying story gave details of the invasion. Apparently, after eating some special plant food that farmer A. L. Butts had sowed on his apple orchard, the grasshoppers grew to an astounding 3 ft. in length—large enough to snap off tree limbs as they leaped about the orchard. 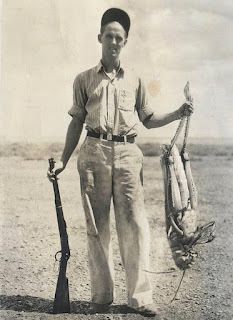 Along with the article, there were photographs of the mutant insects being hunted with shotguns. Because the story was continued on page four, many readers never got to the final paragraph, which suggested that it was all a put-on: "If there are those who doubt our story it will not be a new experience, inasmuch as most newspaper writers are thought to be the darndest liars in the world." The elaborate hoax was concocted by Mr. Butts and the Monitor-Herald publisher, B. J. Fuller. Accompanying Loren's account was the eyecatching photograph that opens this present ShukerNature blog article of mine, except that in Loren's account the photo was reproduced by the book's publisher in mirror-image format, the only instance that I'm aware of in which it has appeared in this orientation. It was one of the pictures that had been included in the above-noted Tomah Monitor-Herald newspaper's hoax report. Not surprisingly, with the coming of the internet such a striking image as this one was not going to go unnoticed and uncommented-upon online, and indeed, it currently appears on countless websites. Yet although on the vast majority of these sites it is readily denounced as a hoax, there is rarely if ever any provision of details supporting such a claim, and on some sites there is even earnest discussion as to whether it actually is a hoax or whether the giant grasshopper portrayed in it is real! In both situations, therefore, it would appear that all such sites are blissfully unaware of Loren's above-quoted account, and also of the more recent version by Leland Gregory – a concise coverage of this phoney incident appearing in Gregory's wonderfully-entitled book Stupid History: Tales of Stupidity, Strangeness, and Mythconceptions Throughout the Ages (2007). It includes the following specific details concerning the photographs contained in the hoax newspaper report: "Accompanying the article were photographs of shotgun-toting hunters tracking down the mutant insects as well as a picture of Farmer Butts holding up a dead grasshopper like a prize fish" – the latter being an excellent description of the famous image opening my own article here. But that is not all. In many online sites containing this photograph, it takes the form of a vintage-looking picture postcard, inasmuch as beneath the main portion of the image (containing Butts holding the grasshopper) but superimposed upon the lowermost portion of the image itself (a section of ground present below Butts's feet and rifle end that was not present in the version of this picture accompanying Loren's account, which was therefore cropped as well as mirror-image-reversed) is white handwriting in the style that was frequently seen in such picture postcards dating back to the first half of the 20th Century. This handwriting provides the location where the photograph was supposedly taken, plus the photo's copyright owner and year. In most examples that I have seen, the information given is: 'GRASSHOPPER SHOT NEAR MILES CITY MONT. © 1937 COLES STUDIO GLASGOW MONT'. 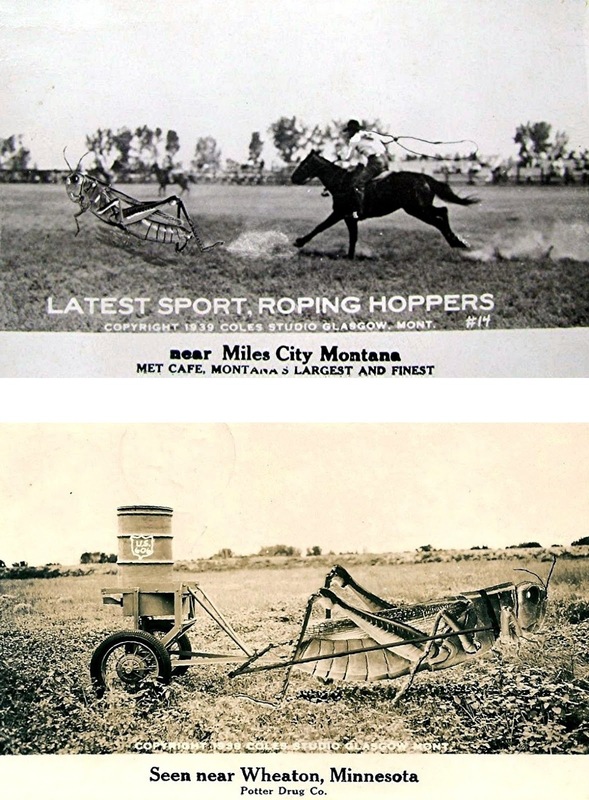 However, I have also seen versions in which the location is variously given as 'NEAR MANDAN NORTH DAKOTA', and 'NEAR MEDORA NORTH DAKOTA' (and in this latter version, the adjective 'GIANT' is applied to the grasshopper). The year and copyright details, conversely, are the same as those given in the Miles City Montana version. 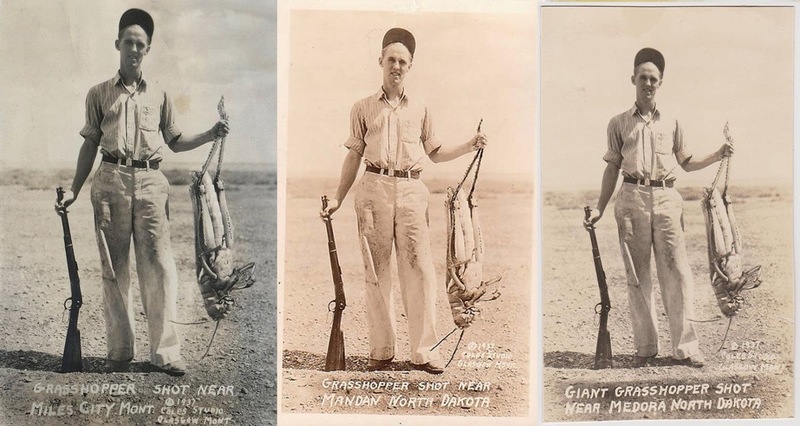 Of particular interest, moreover, is that in one such version (pictured above), labelled as 'NEAR MANDAN NORTH DAKOTA', the angle at which the grasshopper is being held by Butts is slightly different from in all other versions seen by me, and with both of its antennae (not just one) hanging downwards, as well as less of its feet emerging from out of Butts's fist. In other words, this is apparently a second, hitherto-unrecognised photograph of Butts and the giant grasshopper, yet clearly produced during the same session as the famous one, because Butts's pose is identical in both, whereas the grasshopper's is very similar - but not identical - in both. 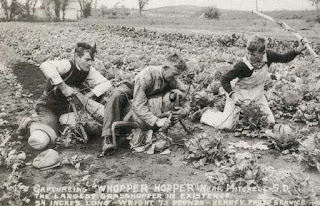 Bearing in mind that the hoax was set in Wisconsin, USA, all of the above-noted claimed locations for the grasshopper shooting given on the various picture postcards are themselves fake. But once again, that is not all. What is particularly odd, and therefore very intriguing, is that I have yet to find a single picture postcard of this image online that actually gives anywhere in Wisconsin as the claimed location! Moreover, the very fact that there are in existence picture postcards depicting this image that date back to 1937, the exact same year in which the hoax report was published by the Tomah Monitor-Herald newspaper, makes me wonder which came first – the picture postcards or the newspaper hoax? If the hoax came first, then the postcards were made as a spin-off using the image from the report and with the writing giving supposed location and copyright details being subsequently added. But if the postcards came first, complete with the writing present, then the writing would need to be removed from them before the image could be included in the report. The easiest way to do this would be simply to crop the photo to just below Butts's feet (exactly as was done in The Book of Lists 3), thereby deleting the lowermost portion of the image containing the writing. But if the latter is true, does this mean that the hoax newspaper report was actually inspired by (and thus made direct use of) a pre-existing picture postcard that occurred with different claimed locations written upon it, but set its fictitious incident in a location (Wisconsin) separate from any of those claimed on the postcard versions? An answer to this key question may well be forthcoming if we knew what format the giant grasshopper photograph takes in the newspaper report? Is the full image present, including the lowermost portion of ground beneath Butts's feet and rifle end but with no writing superimposed, thus confirming that the newspaper report came first? Or is the image cropped to just below Butts's feet, thereby strongly suggesting (albeit not confirming) that there may have been writing on the deleted lowermost portion? That is definitely the all-important question here, one that might shed major new light upon the origin of this iconic photograph. Yet, maddeningly, it is also one that I am presently unable to answer – for the simple yet highly frustrating reason that so far I have been unable to set eyes upon a copy of the two-page hoax report from the Tomah Monitor-Herald newspaper of 9 September 1937. I have managed to locate a version of this story that appeared in the Juneau County Chronicle (of Mauston, Wisconsin) on 16 September 1937, but this is a much shorter version, and only includes a single photograph (and which, unfortunately, is not the one under consideration here), one that is again an evident but much less professionally-produced hoax image. That same photograph, incidentally, depicting Butts and someone else shooting a giant grasshopper in Butts's orchard, is also apparently the opening photo in the original Tomah Monitor-Herald report, and I have been kindly informed by Facebook friend and correspondent Bob Deis that the other person in the photo is none other than B.J. Fuller from the Tomah Monitor-Herald, who, as noted earlier, co-engineered the hoax with Butts. Needless to say, moreover, if anyone reading this ShukerNature article can provide me with a copy of the elusive Tomah Monitor-Herald report (or even any details concerning the appearance of the photograph in question here), I would very much appreciate it! Well worth pointing out here is that picture postcards may well be linked to this hoax newspaper report in more ways than one, because it just so happens that in 1935, i.e. 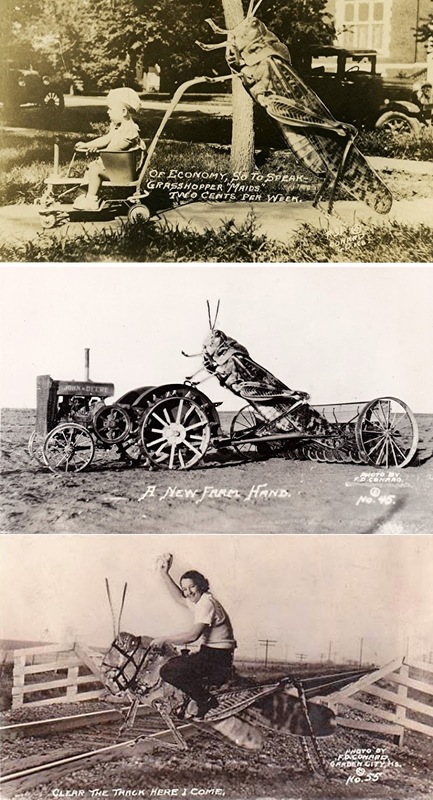 at least two years before this report was published, a picture postcard photographer/publisher named Frank D. Conard from Garden City, Kansas, had begun issuing what would become a very lengthy series of popular postcards depicting humorous illustrations featuring giant grasshoppers and spanning three decades. Long before Photoshop was ever thought of, and eschewing even the popular optical illusion of forced perspective, Conard created his delightful pictures by simply but very effectively inserting enlarged images of grasshoppers into all manner of everyday scenes (a selection of which can be seen below). He also produced similar montage-based pictures featuring other enlarged images of animals, including jackrabbits and fishes. Picture postcards in this highly-collectible genre are known as exaggeration postcards. 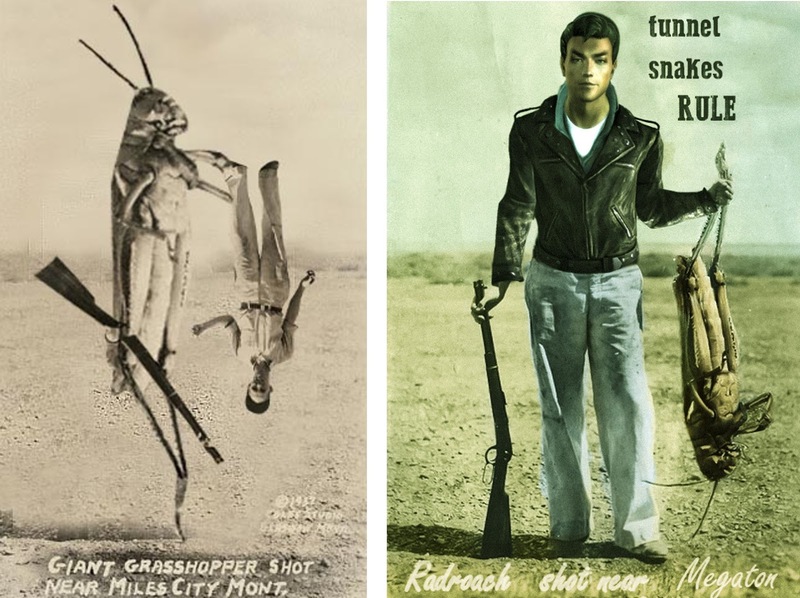 The idea [for producing his famous giant grasshopper-themed exaggeration postcards] came to me after a flight of grasshoppers swarmed into Garden City attracted by the lights, and it was impossible to fill an automobile gasoline tank at filling stations that night. I went home to sleep, but awoke at 3:00 a.m. and all I could think about was grasshoppers. By morning I had the idea of having fun with the grasshoppers, and took my pictures and superimposed the hoppers with humans. I didn't do it for adverse impressions of Kansas, but as an exaggerated joke. Taking all of this into account, could it be that Coles Studio of Glasgow, Montana, the publisher of the picture postcards featuring Butts and the giant grasshopper and labelled with a variety of different claimed locations, was inspired by those of Conard, and/or by the real events that in turn had inspired Conard, to create some grasshopper-themed exaggeration postcards of its own? Indeed, can we even be absolutely certain that the person in this image actually is Butts? After all, if the postcards came first, before the hoax newspaper report, with one such postcard merely being the inspiration for the report and then simply included within it when it was finally published, who can say for certain who the person is in the image? It could be anyone. Butts might simply have lent his name to the hoax newspaper report, with the photo featuring whoever it was who had posed for it as a Coles Studio picture postcard long before the hoax newspaper story had ever been conceived. I've spent a fair amount of time online seeking any details or publication lists appertaining to the output of Coles during the 1930s, in the hope of pinning down specifically when in 1937 the grasshopper postcards depicting Butts (or whoever it is) holding the giant grasshopper were first issued, but, sadly, all to no avail. As for the giant grasshopper itself in the famous Coles Studio picture postcard under discussion here: one further intrigue awaits consideration. Does the postcard depicting it simply consist of an enlarged photo of a normal grasshopper that has been carefully inserted into a photo of Butts(?) in the normal montage-style manner of creating exaggeration picture postcards (but in at least two slightly different poses, as revealed earlier)? 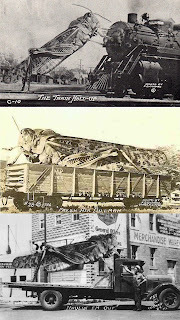 Or could the grasshopper have possibly been an actual full-sized giant grasshopper model? When he displayed his invention at Corn Palace Week in Mitchell and charged a nickel to view it, he earned enough to support his family for a winter. Hersey ended up with a commission from a man who hired him to make a housefly, a flea, a black widow spider and a monarch butterfly to show at county fairs. Hersey even produced a picture postcard of Galloping Gertie (the image included by me above), in which he is shown pretending to hold it down, assisted by his nephew Harry (Bart) Hersey and David John Hersey, and which also bears the caption 'Capturing "Whopper Hopper" near Mitchell, S.D. 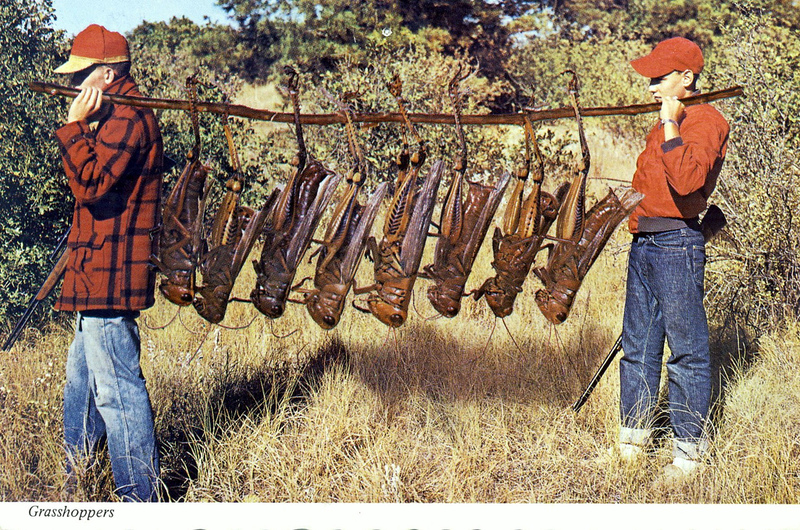 The largest grasshopper in existence 54 inches long weight 73 pounds'. And it is this picture, often reproduced sans caption, which is the one doing the rounds online. So, yes, models of giant grasshoppers are not beyond the realms of possibility at all. As for real-life giant grasshoppers, conversely, that of course is a very different matter. For fundamental anatomical and physiological regions, especially ones relating to respiration, no species of insect living today could attain the stature of those included in any of the images presented above in this present article. Having said that, and albeit on a much more modest scale, there are some undeniably impressive species of grasshopper native to various parts of North America, but none more so, surely, than the eastern lubber grasshopper Romalea microptera (=guttata). Common throughout Florida, but up to 4 inches long, and brightly coloured in garish yellow, orange, and red with black stripes to warn would-be predators of its toxic nature, it came as something of a shock to me when I first encountered this monstrous entity while visiting the Everglades back in 1981. A slow-moving species not given to energetic hopping and generally too heavy to fly via its undersized wings, there seemed to be lubbers crawling underfoot everywhere, emitting loud hisses and secreting foul-smelling foamy exudations, until I was more than happy to step onto one of the boats to take me away from these hexapodal horrors and on through what seemed by comparison to be the relative tranquillity of the alligator-infested swamps! 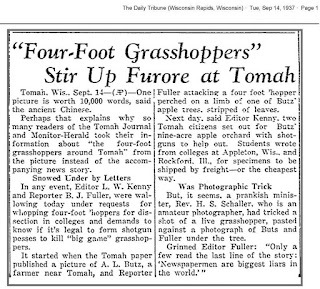 Meanwhile, my search here and online continues apace for the final piece of the long-incomplete jigsaw constituting the mystery of the Butts giant grasshopper phoney photograph – that evanescent newspaper report from the Tomah Monitor-Herald of 9 September 1937. Once – if ever – I have that to hand, I may finally be able to determine in best chicken and egg tradition which came first, the Coles Studio picture postcards of this memorable image or its appearance in the newspaper report. So, once again, if there is anyone out there reading this ShukerNature article who can offer any information (including a specific first publication date for the picture postcards), or, best of all, an image of the two-page newspaper report, I would be very happy to hear from you! 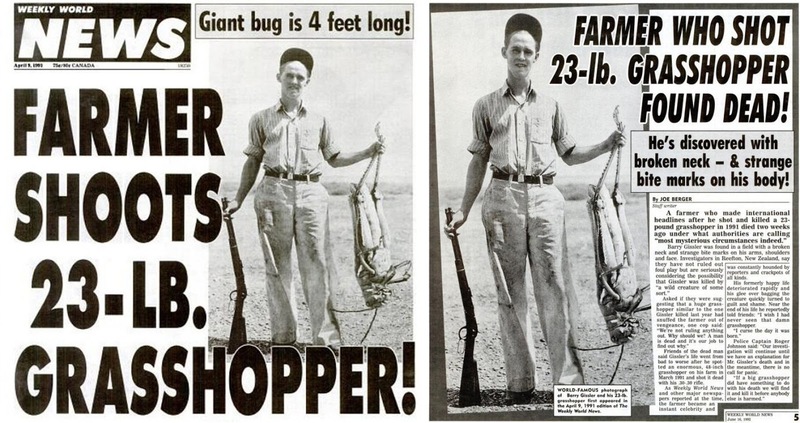 Finally: how could any photograph featuring a man holding a 3-ft-long grasshopper fail to attract the attention of the wonderful Weekly World News? Sure enough, this inestimable publication has featured the Butts photo in not one but two WWN stories. 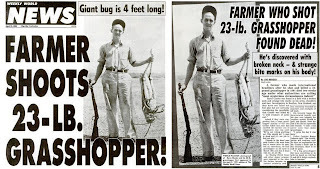 In the first, published on 9 April 1991, it was used as the basis of a highly entertaining report concerning a New Zealand farmer named Barry Gissler who had shot a 23-lb giant grasshopper less than a month earlier, on 15 March. And in the second, published just over a year later on 16 June 1992, the unfortunate Mr Gissler had alas been found dead with a broken neck and strange bite marks on his body. 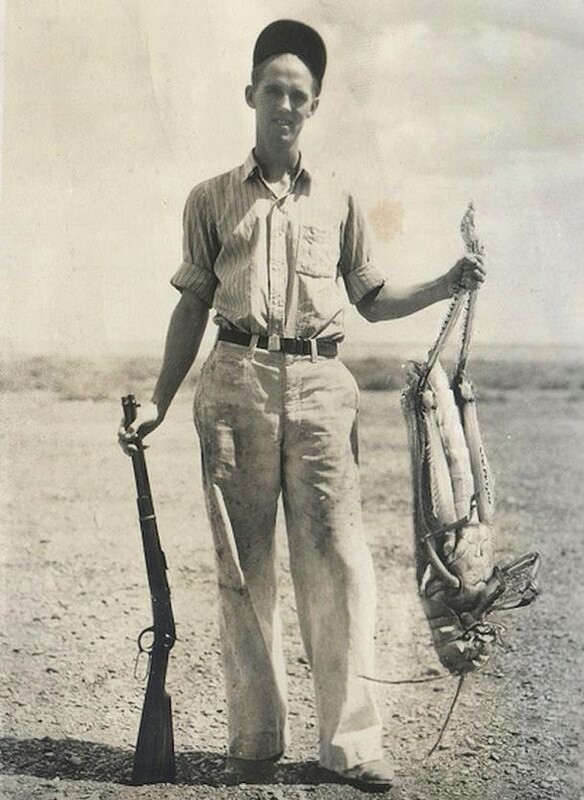 Had New Zealand's mega-hoppers taken revenge upon the murderer of one of their burly six-legged brethren? Only the WWN can answer that question – and who knows, perhaps one day, in a third fascinating instalment of this gripping grasshopper yarn, it will do! Incidentally, just in case you were wondering: The world's largest known true grasshopper (as opposed to the highly-specialised wetas of New Zealand) is a currently-unidentified species documented from the border of Malaysia and Thailand that measures 10 in long and is capable of leaping up to 15 ft. So perhaps giant grasshoppers are not such a figment of fantasy after all! NB – As far as I am aware, all of the illustrations included here are in the public domain unless stated otherwise. In any case, however, they are all included here on a strictly non-commercial Fair Use basis only, exclusively for educational, review purposes. 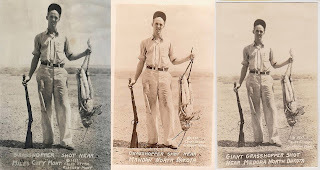 The picture at the left shows one of the big hoppers that had been shot. So even now, there is no categorical proof that the man in this photo really is Butts. As for the photograph itself as included in this hoax report, it is the more familiar version, i.e. with only one of the grasshopper's antennae hanging straight down (the other one curling almost horizontally to the left), and with a substantial amount of the grasshopper's back feet emerging out of Butts' fist. Moreover, it is neither in mirror-image version, nor, significantly, does it contain any details of location, date, or the Coles Studio in handwriting beneath Butts and the grasshopper – because in this newspaper report the image is cropped to just below Butts's feet. This therefore lends weight to my earlier suggestion that it was the picture postcard of this image (with the details in handwriting superimposed upon an additional, lowermost section of the image, present beneath Butts's feet) that came first, before the newspaper report, and which had then been incorporated into the newspaper report by the simple expedient of someone having cropped beforehand that lowermost section of image containing the handwriting from the main portion of the image. Why else would the image have been cropped? It wasn't as if the section of image beneath Butts's feet was extensive and would therefore occupy space that could be better used in some other way within the report. And despite all of my numerous, extensive searches made in relation to this image, I have never once come upon a version of it that retains this missing lowermost section but without the handwritten source details, etc., being superimposed upon it. Consequently, until (if ever) any such version of the image does turn up, it seems parsimonious to conclude that this iconic image did indeed begin life as a Coles Studio exaggeration picture postcard, issued some time in 1937 but definitely prior to the publication of the hoax newspaper report in the Tomah Monitor-Herald on 9 September 1937, and that it then appeared within that report in cropped form, with all details of publisher, date, and location having been deleted, and with the very terse, uninformative reference to it within the main text of the report suspending over it in Damoclesian verisimilitude a potentially perpetual question mark as to whether the man depicted in it was indeed Butts at all. 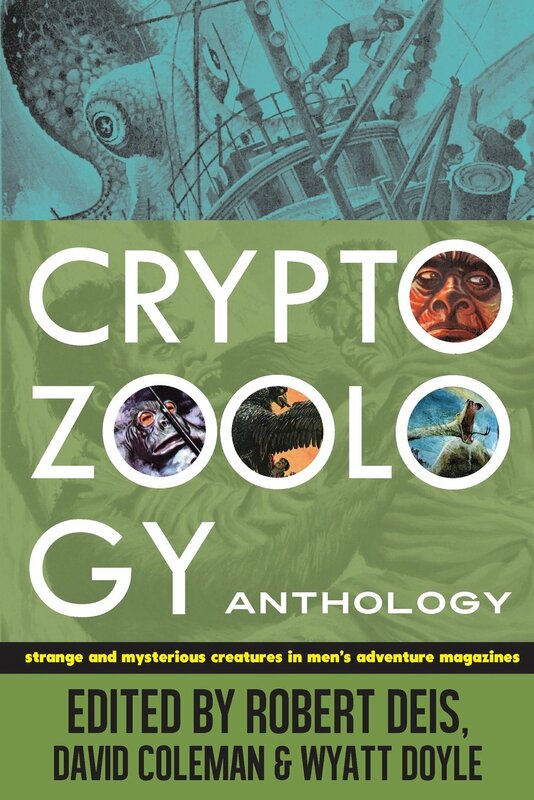 Finally, be sure not to miss out on Bob Deis's awesome Cryptozoology Anthology: Strange and Mysterious Creatures in Men's Adventure Magazines – check it out here! Great article. For more grasshopper entertainment, dial up the 1957 classic "B" movie "Beginning of the End" for Hollywood's take on the giant grasshopper. An interesting story I hadn't heard of before. Always nice to find someone new on your blog Karl. I assume you have asked the newspaper itself? Yes I have, but I didn't receive a response. However, a foaf (friend of a friend) has promised to try and track it down for me later this week, so fingers crossed! Coles Studio apparently did a series of grasshopper cards, according to someone from Miles City. The comment is very close to the bottom of a long page so best to find in page with "coles". 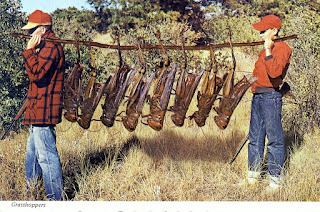 Yes indeed, it was the above-cited milescity.com forum posts page that I used as my source of info re the Coles Studio giant grasshopper exaggeration postcards, although unfortunately the only picture of one that was labelled as being a Coles Studio postcard was the famous one that is the subject of this article of mine. 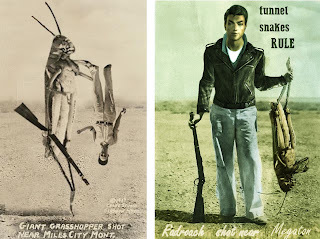 Thanks very much indeed for the most useful links to sales of two other Coles Studio giant grasshopper exaggeration postcards - I hadn't seen either of these before, so it is excellent to do so now! Is it possible to re-upload image of the original two-page Tomah Monitor-Herald? For some reason, there is no image of the scanned document. The reason why there is no image of the scanned document is that it was supplied to me by the newspaper archive on the understanding that it was for research purposes only, and was not to be reproduced, so I haven't.